Chandler is the southernmost city in the greater Phoenix area, bordered by Tempe to the west, Mesa to the north and Gilbert to the east. Major thoroughfares are I-10, Loop 101, Loop 202 and Hwy 87 (Arizona Avenue); hotels and shopping centers are concentrated along these routes, the main mall being Chandler Fashion Center at the 101/202 intersection, with over 180 outlets. The city has its own airport (Chandler Municipal), and the downtown area is about 20 miles from Phoenix International Airport. Away from the main roads stretch several square miles of residential estates, becoming more luxurious towards the edge of the city, in particular around Ocotillo Golf Resort to the south and the Foothills area to the west, beneath the South Mountains. The main area for corporate offices (Chandler Business Center) is by the I-10/202 junction. The luxurious Crowne Plaza San Marcos Golf Resort is one of the most upmarket hotels in Chandler, a short walk from the 18-hole San Marcos Country Club golf course & driving range, and within 3 miles of all the main shopping areas in town such as the Chandler Fashion Center and the East Valley Mall. The resort runs a complimentary shuttle within a 5 mile radius, including to Chandler Municipal Airport. All 295 rooms & suites have a balcony or patio looking out over the hotel's swimming pool or its decorative courtyards with fountains and palm trees. For dining, guests can choose from two restaurants, one cafe, and two lounges. Room service is available, and other main facilities are a fitness center, gift shop, beauty salon, concierge, sports court, and no fewer than 29 meeting rooms - over 32,000 sq ft of event space. Marriott Chandler is a full service, 264 room property on the south side of the city, part of a recent development along Price Road, south of Loop 202, adjoining the Gila River Reservation. The hotel has eight floors, and includes over 20,000 square feet of indoor/outdoor event space, now the largest in the city. There are several restaurants, shops and other businesses within walking distance, and many more one mile north on the far side of the freeway at Chandler Village Center. Onsite food/beverage outlets are Starbuck's, a bar, and an all-day restaurant serving Mediterranean and Southwest-influenced dishes. Opening of the Marriott is scheduled for October 2019. Hilton Phoenix Chandler is one of a group of hotels close to Chandler Fashion Center Mall, at the 101/202 intersection - near the edge of the city, close to open farmland to the south. The place is quite large, offering 197 oversized, nicely decorated rooms that include two types of suite; Junior (564 sq ft) and Executive (728 sq ft), the latter complete with a private balcony. Guests staying in the Executive Level rooms receive complimentary breakfast and evening snacks. All-day, on-site dining is provided by Cafe 2929 and Taste Bistro, while drinks, evening meals & live music are available from R Bar. The hotel also has a poolside bar. The business and fitness centers are both open 24 hours a day, while the meeting space can accommodate events of up to 350 people. DoubleTree by Hilton Chandler Phoenix provides a complimentary shuttle service to places within a five mile radius, such as Ahwatukee Foothills Town Center, Chandler Mall, and the many corporate locations along the Loop 202 corridor to the east. The hotel is part of a commercial district by the 202/I-10 intersection, right on the south edge of greater Phoenix, so along with the neighboring properties offers the first lodging for visitors arriving along the interstate from Tucson. The DoubleTree has a courtyard design, half the rooms looking inwards over an enclosed outdoor pool and sundeck, partly shaded by tall palms. The hotel's restaurant is open for breakfast & dinner; all the other usual meetings, business & leisure facilities are available. Opening is scheduled for late 2019, after full renovation of an existing property. Beside the Ocotillo Golf Course in south Chandler, the elegant Holiday Inn Chandler hotel (Ocotillo Road) enjoys a quiet, peaceful setting in an upmarket residential area close to the edge of the desert, yet just 5 miles away from fine shopping and dining at the Chandler Fashion Center. The hotel its own restaurant open for breakfast, lunch and (limited) dinner, plus a lounge/bar, and room service; the neighboring golf resort has other dining options. At the rear is a sheltered outdoor pool and a palm tree-lined garden, while facilities inside include a gift shop, fitness center, hot tub and business center. Highlight of the recently renovated Courtyard Phoenix Chandler is an especially pretty courtyard garden comprising a pool, hot tub and sundeck surrounded by lawns, tall palms, and other tropical plants. The hotel sits next to a shopping center alongside I-10 (reached from exit 159, Ray Road), opposite another mall (Foothills Park Place), close to many businesses along Chandler Boulevard, yet also just a short drive from the unspoilt country of South Mountain Park. The Courtyard has 156 clean, comfortable rooms & suites, a fitness center, cafe serving breakfast, guest laundry and 5 meeting rooms. The Courtyard by Marriott hotel in southwest Chandler sits at the edge of the countryside along Price Road by the 202/101 junction, one mile south of Fashion Center Mall and 15 miles from Phoenix Sky Harbor Airport. Open late summer 2009, the handsome, 6 floor building contains 150 brightly-decorated guest rooms, equipped with executive desk, flat screen TV and free internet access. The Bistro is open for breakfast & dinner, or for more choices there are plenty of restaurants a little way north, on the far side of Loop 202. Also available are two meeting rooms, a business library, an outdoor pool and health club. The Residence Inn is amongst the southernmost hotels in the Greater Phoenix area; in the upscale Ocotillo district of south Chandler, at the edge of a small business park overlooking an artificial lake on three sides. In the vicinity are several restaurants, with a number of golf courses within a few miles. The extended stay/all-suite hotel features free daily hot breakfast, free weekday evening receptions, meetings facilities, a convenience store and an outdoor pool. All accommodations contain a full kitchen, and are available in two bedroom, one bedroom and studio configurations. The more luxurious of two adjacent all suite Marriott hotels next to Chandler's Fashion Center Mall caters more to the long stay business or leisure traveler, being close to many business headquarters, though is also suitable for single night visits. Regarded as one of the top hotels in town, it has particularly clean, comfortable, well equipped rooms including a full kitchen - food for which can be ordered via the free grocery shopping service. Other free items are daily hot breakfast and weekday evening reception. The list of amenities is completed by a pool, hot tub, sports court, one meeting room, guest laundry and business services. The hotel is situated on Chandler Boulevard, a block west of the Price Freeway. Staybridge Suites Phoenix Chandler was constructed summer 2014, at the intersection of Chandler Boulevard with McClintock Drive, within a short walk of Chandler Fashion Center to the east. One other attraction close by is Desert Breeze Park, which includes a playground, lake, railroad, sports courts and picnic areas. The hotel offers modern, all-suite accommodations in one or two bedroom configurations, all featuring separate sleeping/living areas and a fully-equipped kitchen. Daily hot breakfast buffet and light evening meals (Tuesday to Thursday) are complimentary. Meals may also be cooked using the fire pit or bbq grills. An outdoor pool, hot tub and fitness center are available for relaxation. The hotel has a business center and a meeting room, maximum capacity 50. One of two Homewood Suites by Hilton hotels in Chandler, the Detroit Street property features 83 one or two bed suites (complete with fully-equipped kitchen and separate living area), arranged around a secluded courtyard garden, location of the outdoor pool. There are several restaurants close by, and many corporate offices to the north and south, including Verizon, Basha's, Avnet, Intel and ADP. Hot breakfast and evening receptions (Mon-Thu) are provided free of charge. Meeting rooms, a business center, fitness center, gift shop, lounge and convenience store are some of the many other facilities. The Homewood Suites by Hilton in Chandler is part of a small group of recently built hotels along Price Road just south of the 202 freeway, between a residential area and the undeveloped lands of the Gila River Indian Reservation, close to South Mountain Park and other scenic desert areas. Fashion Center Mall and Chandler Regional Hospital are both just over a mile away. The hotel provides 133 modern studio, one bed or two bed suites equipped with a full kitchen, two TVs, two phones and free internet access, while other amenities include daily free hot breakfast, free weekday evening receptions, a meeting room and a range of other business facilities. Hampton Inn Phoenix Chandler is one of the older properties of this popular brand, occupying a compact, six floor building next to a Hilton sister property (the Homewood Suites), situated along Chandler Boulevard near the I-10 intersection, though set back from the main road behind a 24 hour Denny's restaurant. There are plenty more dining outlets nearby, in a mostly business neighborhood. The site is well shielded by trees from adjacent properties, and a line of palms provide shade to the outdoor pool/hot tub at the front. Inside, the 101 room hotel has amenities of a fitness center, a business center and a 450 square foot meeting room. Hot breakfast is complimentary. Hampton Inn Chandler is built in a lightly developed area beside the Price Road intersection with the 202 and 101 freeways, close to the edge of farmland to the west. Like the adjacent Homewood Suites, which shares the parking lot, the hotel is a beautiful, modern property, the exterior attractively finished with stone cladding and a range of earthen tones. The 153 guest rooms all contain a microwave & refrigerator, and the accommodations include a number of studio suites with a spacious living area and wet bar. Although free hot breakfast is provided, the rather isolated location on the south side of the freeways means that the nearest restaurants are relatively far away (about a mile), around Chandler Mall. The hotel has an outdoor pool, fitness center and one meeting room. Open late summer 2017, the 109 room TownePlace Suites in Chandler is part of a group of hotels and restaurants beside the Fashion Center Mall, along Chandler Boulevard one block west of Price Road, and a short drive from the intersection of highways 101 and 202. All accommodations are suites (two bedroom, one bedroom and studio layouts), with full kitchens and separate living areas. Daily hot breakfast is complimentary, as are the weekday evening receptions. A fitness center is open 24 hours a day, and guests also have use of an outdoor pool. Pets are welcome. The 101 bright, colorful, extra large rooms at the SpringHill Suites Phoenix Chandler feature comfortable bedding, separate sleeping/working/living areas, and a kitchenette equipped with microwave, refrigerator & sink. Free hot breakfast buffet is served, and the hotel has leisure amenities of an outdoor pool, a hot tub, and an exercise room. As well as the Fashion Center Mall plus associated restaurants, the nearby 101 and 202 freeways put guests at the SpringHill Suites within easy reach of all other sites in Chandler and in the adjacent cities of Tempe, Mesa, Gilbert and Phoenix. Hyatt Place Phoenix/Chandler has a fine location just across the street from the Fashion Center Mall, a short drive from the 101 and 202 freeways, and 4 miles from I-10. Also close by are Gila River Airport and South Mountain Park. The suite-style accommodations are in three blocks either side of a central courtyard garden with palm tree-lined pool; all contain a refrigerator and sofa bed. Wi-fi and hot breakfast are complimentary, while drinks and snacks are available all day at the 24/7 gallery. A meeting room can be used for events of up to 45 guests. The large Clarion Hotel Phoenix has three blocks arranged around an outdoor pool with tropical gardens, by the Elliott Road exit of I-10 and within sight of the cactus-covered South Mountains which rise a short distance west. Nearby attractions include the Ahwatukee Country Club, South Mountain Park and the Tempe Sports Complex, plus there are many businesses, shops and restaurants in the vicinity. The hotel is also convenient for Tempe, West Chandler, Kyrene and Guadalupe. The buildings and all rooms are very clean and well looked after; the main hotel amenities are free hot breakfast, free evening reception, free airport shuttle, fitness center and business center. The Cambria is an early 2018 addition to the range of hotels around the Fashion Center Mall on the south side of the city, right next to the busy Hwy 202/Loop 101 intersection, and within easy walking distance of all the stores and restaurants in the vicinity. The oversized rooms and suites all feature a microwave, refrigerator and work desk, while the hotel also provides the usual amenities of a business center, fitness center, meeting room, convenience store, hot tub and outdoor pool, plus an onsite bar/restaurant. Hot breakfast and weekday manager's receptions are complimentary. The well-equipped accommodations at Hawthorn Suites Chandler Phoenix are divided into several two floor blocks, part of a spacious, tree-lined site at the corner of Chandler Boulevard & Kyrene Road; 3 miles from Chandler Fashion Center and close to several corporate headquarters including Qualcomm and Intel. All one or two room suites have a full kitchen, good quality furnishings and comfortable bedding. Complimentary amenities are hot breakfast, evening receptions (Tue to Thu), internet access and a daily newspaper. An outdoor pool, whirlpool and barbecue area are available for recreation, and there are also facilities for meetings & business. The surroundings of Holiday Inn Express Phoenix/Chandler are mixed rural/residential - the hotel is beside I-10 (exit 160), just north of Chandler Boulevard, and about 1 mile from the edge of the Phoenix suburbs and the start of the open desert of the Gila River Indian Reservation. 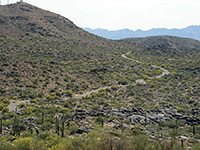 A little further west is the 16,000 acre South Mountain Park, one of the largest municipal parks in the USA, and offering many hiking, riding & cycling opportunities. Accommodation at the Holiday Inn Express consists of 125 rooms, not particularly new but well maintained, containing a refrigerator & a microwave. Free deluxe continental breakfast is served each morning, and the hotel has the usual three leisure facilities of fitness center, hot tub and outdoor pool. The Best Western hotel in Chandler is an older building along Arizona Avenue (Highway 87) close to the town center, occupying a tree-lined enclosure in a mixed residential/commercial area, within walking distance of various restaurants and small shops. The 2 floor hotel is a mile away from attractions such as Chandler Park, East Valley Mall, the San Marcos Golf Resort and Chandler Art Center; it offers an outdoor pool, hot tub, free breakfast, and quite cheap rates. All 48 rooms have a microwave and a refrigerator. The 87 room/suite Best Western Plus (open late summer 2016) has a westerly location in Chandler, beside I-10 at the Sundust Road exit (162), right at the edge of the desert - the hotel is the first hotel in the greater Phoenix area to welcome travelers arriving from Tucson and the south. Sites within half a mile include a truck stop, casino, outlet mall, golf course, a selection of restaurants, and the Wild Horse Motorsports Park. Chandler city center is ten miles east, while Phoenix international airport is 13 miles north, all along the interstate. Hotel amenities are the usual free hot breakfast, free wi-fi, fitness center, pool & hot tub, business center & meeting space. Fairfield Inn Chandler forms half of a new Marriott development along Price Road, just south of the 202/101 intersection on the southwest side of the city. Guests are able to share some of the facilities of its neighbor (the Courtyard), including a lobby bar and the Bistro restaurant, while the hotel's own amenities include an outdoor pool, hot tub and a modern fitness center. The Fairfield Inn has 110 rooms & suites, the latter with refrigerator/microwave, and all furnished with the luxurious Marriott bedding. Internet access is free, as is the breakfast buffet, which includes a hot sandwich. The hotel opened late summer 2009. Rooms at the pet friendly Comfort Inn Chandler look out north or south, with views through the enclosing trees to the mixed business/commercial neighborhood - on the east side of Interstate 10 close to the junction with Loop 202. The site includes a good-sized parking area and a sunny outdoor pool, while nearby are at least half a dozen restaurants. Complimentary amenities are wi-fi and breakfast, including a few hot items. Guest rooms feature a hair dryer, refrigerator, coffee maker and ironing equipment. Near the southwest edge of Chandler, the Quality Inn hotel has a fairly quiet location along the main road through town (Chandler Boulevard), with Kyrene Village Shopping Center on one side and the houses of Gila Springs Village on the other. The hotel is a newer, interior corridor building offering moderate prices and amenities of an heated outdoor pool, free breakfast, guest laundry, and microwaves/refrigerators in all 70 rooms. Like most hotels in the Phoenix area, the grounds of Super 8 Chandler are attractively decorated with palm trees and other desert plants, and the place has a peaceful atmosphere, especially to the rear, where the guest rooms look out across the outdoor pool to a patch of farmland beyond. Elsewhere, the surroundings are a mix of business and industrial premises centered on Chandler Boulevard, near the the busy intersection of I-10 and Hwy 202. There are five restaurants adjacent or. Other highlights of the affordable, pet friendly hotel are free eight item continental breakfast, fitness & business centers and a microwave/refrigerator in all accommodations. The Motel 6 enjoys quiet surroundings on the south side of Chandler, near several other hotels; beside the Chandler Boulevard intersection of I-10, though 400 feet from the main road, and with lines of trees providing a barrier between the adjacent properties. The place is relatively small, with 50 rooms on two exterior corridor floors, and it offers basic amenities, of an outdoor pool, free morning coffee, free wi-fi and coin-operated laundry. Some rooms have a microwave and refrigerator.